First of all this writer no longer votes and his findings are shared only to give the reader a different perspective on the dismantling of the Game of Life as he knows it. Disclaimer: It is not this authors responsibility to convince or even suggest any individual believe what is written here, it is the sole ( SOUL ) responsibility of each individual to decide what their journey means to them. This author understands all things are a form of energy. All stories and games have the hidden story of the journey of the soul, come back to the conquering aka mastering of the number 8, as it is where you will find the truth within. The number 8 hi-jacked the creation we call Man by impersonating or believing it was the ONE. This energy of number 8 has been transformed back to the original source and what is happening for those who see beyond the chaos are now being healed with the love energy coming into this hologram where the psyche ( soul ) has been trapped. The English alphabet has 26 letters and the number system for these letters are 1,2,3,4,5,6,7,6,5,4,3,2,1 for the first 13 letters A-M and the number system for the last 13 letters are 1,2,3,4,5,6,7,6,5,4,3,2,1, N-Z. Notice that the number 7 is in the middle of the each sequence. Origin of this cypher may have come from Freemasons, who could have adopted it from the Kabbala or Chaldean numerology systems. Gematria is a method of interpreting words, based on numerical values of letters. (Greek geometria) Every thing that is created by man involves mathematics, geometry aka Sacred Geometry (Pi). I find it interesting the words Gematria and Geometria when added using the cipher equal 70 and if we use decimal parity 7+0 = 7. Why is this significant, well if you spell out 7 seven it equals 22 and 22\7 = 3.142.. which is the closest known fraction to Pi (P3,I5 ) = 8. This writer will be using simple math aka addition, subtraction, multiplication and or division in the work below. The United States presidential election of 2016 was the 58th quadrennial American presidential election, held on Tuesday, November 8, 2016. The number 58 is the sum of the first 7 prime numbers 2+3+5+7+11+13+17 = 58, 5+8 = 13 and 17 is number 7 in this string. Donald John Trump (D4,O2,N1,A1,L2,D4) 14, (J4,O2,H6,N1) = 13, (T7,R5,U6,M1,P3) 22, 14+13+22 = 49, 4+9 = 13, 1+3 = 4, Seventeen (S6,E5,V5,E5,N1,T7,E5,E5,N1) = 40, 4+0 = 4. Using her maiden name Hillary Diane Rodham = 58, 5+8 = 13, 1+3 = 4. These two names added together = 107 or 8. Notice how Hilary`s maiden name equal the exact same number as the first 7 prime numbers. In the Electoral College vote on December 19, 2016 there were seven faithless electors; two defected from Trump while five defected from Clinton. The final count was Donald 304 and Hilary 227 a difference of 77, 7+7 = 14, 1+4 = 5, 7 x 7 = 49, 4+9 = 13, 1+3 = 4. It has been reported that Donald and Hilary are cousins through 19 generations. Some individuals know this war for power between the bloodline has been going on from the beginning of the game. This writer likes to take it to the extreme when diving into hidden meanings. In this Game of Life there are many games and the two major ones are Chess and Scrabble. The game of chess is played on a 4 sided square board 8 x 8 = 64. 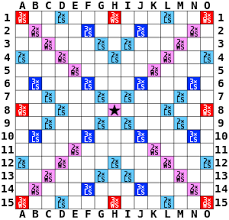 The game of scrabble is also played on a 4 sided board 15 x 15 = 225 = 9 with a 5 Point star in the middle. If you start at any corner and in the middle of each outside row and count the squares moving towards the star you will have 7 and the star would be number 8 and if you start from each corner and count down and across to the middle in each row you will find it to also be 8. Robert Swan Mueller 17 letters, Born: August 7, 1944, 8+7+1944 = 33, he served as the 6th. Director of the FBI ( F6,B2,I5 ) = 13. William ( W4,I5,L2,L2,I5,A1,M1 ) = 20, Pelham ( P3,5,L2,H6,A1,M1 ) = 18, Barr ( B2,A1,R5,R5 ) = 13, 20+18+13 = 51 = 6. Chess ( C3,H6,E5,S6,S6 ) = 26 Scrabble ( S6,C3,R5,A1,B2,B2,L2,E5 ) = 26, 26+26 = 52 = 7, There are 13 letters used to spell these two games. mid 16th century (in the sense ‘make marks at random, scrawl’): from Middle Dutch schrabbelen, frequentative of schrabben ‘to scrape’. The noun sense ‘struggle to achieve something’ is originally a North American usage dating from the late 18th century. Below are the point values for each letter that is used in a Scrabble game. Skull = 19 Bones = 16 = 35 and Skull minus Bones = 3, March is the third month of the 12, = 3.
noun: chess- a board game of strategic skill for two players, played on a checkered board. Each player begins the game with sixteen pieces that are moved and used to capture opposing pieces according to precise rules. The object is to put the opponent’s king under a direct attack from which escape is impossible ( checkmate ). Middle English: from Old French esches, plural of eschec ‘a check’ (see check1). I leave this for the reader to ponder ” English Alphabet ( E5,G7,L2,I5,S6,H6 ) = 32, ( A1,L2,P3,H6,A1,B2,E5,T7 ) = 27, 32+27 = 59, 5+9 = 14, 1+4 = 5 and in scrabble X marks the spot aka Five Point Star ( F6,I5,V5,E5 ) = 21, ( P3,O2,I5,N1,T7 ) = 18, ( S6,T7,A1,R5 ) 19, 21+18+19 = 58 ” and ” English Language ( E5,G7,L2,I5,S6,H6 ) = 32, ( L2,A1,N1,G7,U6,A1,G7,E5 ) = 30, 32+30 = 62 “.